Painting is edited by Terry R Myers and he has done an excellent job. The texts he has selected cut straight to the chase and address the urgent issues in contemporary painting with clarity. In his introduction to the book he clearly lays out the context in which he selected texts: the context of the death of painting. He reminds us that since Paul Delaroche first saw a Daguerreotype in 1839 and exclaimed, “from today painting is dead!” the history of painting is inseparable from the stories of its demise. This is the first anthology of texts since the 1980s on painting and it is this defining feature of Painting that ensures its contemporary relevance. 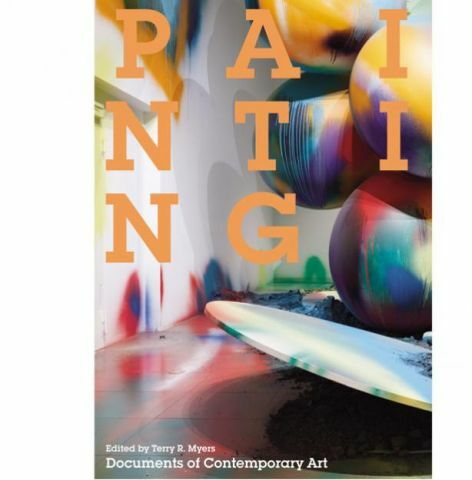 Myers, through this selection of texts, aims to assert that painting remains relevant today because it acknowledges, if not exaggerates its contradictions – contradictions in terms of abstraction-figuration as well as its unique relationship with its own death and relevance. This anthology doesn’t shy way from critical theory (the second text is by Deleuze) and Myers’ emphasis on texts by artists is refreshing but, of course, there is always scope for more. I would have liked to see Dominic McIver Lopes’ chapter on Painting from The Routledge Companion to Aesthetics for example, to represent an analytic rather than continental philosophical point of view (that, and the fact that it’s a brilliant piece of writing). I urge anyone serious about contemporary painting to read this book. It certainly got me thinking. In 1999 I encountered a new kind of painting first hand (well, new to me). I’d enrolled on a BA in Painting and Drawing at the University of Huddersfield, but it was at the halls of residence that I found it. The halls where I lived in my first year were built on top of Storthes Hall Psychiatric Hospital. About half the hospital buildings were still standing, so one night we decided to break in. Campus security was quickly on our case and we found ourselves crawling through a field in full camo gear heading for the woods. Eventually we lost them and broke into the buildings. It immediately became clear why security was so tough. The floors had fallen through, it was pretty dangerous, and also in their hurry to vacate the site the NHS had emptied filing cabinets leaving sensitive documents revealing much about patient life at the hospital, which was more of a village hidden in the woods. We then came across paintings made by patients mounted on the walls. It reminded me of the movie Crazy People – coincidentally, if you Google “Crazy People Painting”, the first image to come up is of Jackson Pollock. Painting as art therapy for psychiatric patients is after all a type of painting. I spent Christmas this year in Majorca where my nieces reminded me of another kind of painting, that of children. These two examples can be viewed in two ways: they are both clearly painting, in the sense that they involve the application of paint to a surface but either they are art or they are not. If they are kinds of art, and anyone who makes paintings is an artist then they can surely be judged in terms of quality i.e. they are not great art. Alternatively we can claim that some painting is not art. I am for the latter, for me, clearly “painting and decorating” is not art. Neither is mass produced tourist rubbish. However, when does painting become “art”? This is a question that remains debated and yet, it is surely a fundamental question, one that must be tackled if we are to continue to have painting as art. This question has surfaced many times under the guise of the “painting is dead” assertion. Clearly painting is not dead, as people have continued to paint, perhaps the claim should be “painting as art is dead”. Either way it’s wrong, of course. Painting still exists as art, much to the bemusement of many an art critic. Such questions were directly addressed by Jim Shaw in his 1990 project Thrift Store Paintings. Shaw amassed a large collection of amateur art from second hand shops. I saw the collection at the ICA. It was immediately obvious that what I was looking at was bad painting. But what made it bad? Was it still art, just bad art? Then, there were some paintings which, placed in a different context, might be viewed in a completely different way – deliberately naïve for example. The chapter Thrift Store Paintings is disappointing as it is made up entirely of a selection of titles from the collection. The hilariously imaginative titles do, however, provide an opportunity for us to reflect on the concerns and interests of the untrained artist, the everyday person without considering their technical ability. During my masters degree in Painting it occurred to me that sculpture doesn’t have the same problem because it has long since thrown off the shackles of its history. Look in any sculpture department across the UK and you will be surprised to see anyone carving marble or casting in bronze. In fact, if anyone is carving anything they are likely to be in the minority. Even plinths have all but disappeared, replaced by installations, video, found objects, and, well, anything 3D…or not even 3D. So why then is it that painting continues to exist along broadly traditional lines in UK painting departments? Gilbert-Rolf offers one explanation by reminding us of painting’s unique properties in his chapter Cabbages, Raspberries and Video’s Thin Brightness where he compares painting to video. We are not surprised to still see oil on canvas in UK Art Schools, and perhaps Gilbert-Rolf does provide one reason for this, but it needn’t be the case of course. Painting provides us with plenty of reminders that painting can, and does exist as projection, digital painting, painting on 3D objects, murals, banners, hangings, conceptual painting and more. Daniel Birnbaum’s chapter Where is Painting Now? is a good example. Birnbaum references Olafur Oliasson’s Green River project, and Alÿs’ The Leak as two examples of contemporary avant-garde acts that push painting to its limits and combine it with performance. He goes on to ask if Gursky and Struth could not be considered as leading contemporary landscape painters. This reminds that painting is a philosophical activity, not necessarily involving paint. There are those who believe that Fine Art is defined by its medium specificity – i.e. you only paint if it’s conceptually appropriate to paint it, otherwise you might prefer to make a film, for example. But then again, there are those who describe themselves as artists who explore specific concepts through paint (and only through paint). Painting, after it’s concise introduction and clear argument, leaves us to draw our own conclusions about the relationship between painting and art. The fact that there is no real answer or consensus makes the future or painting all the more uncertain, and exciting.